After creating draft invoices via invoice run or manually, you check them for correctness. If necessary, you must edit the draft invoices. Editing invoice details like basic data, addresses, distribution instructions, texts, etc. You can modify invoice data and invoice line items as long as invoices have the status Draft. Invoice Date Specifies the (legally binding) invoice date to be printed on the invoice document. Invoice No. Specifies the invoice number. In Draft status, the numbers are temporary and of no legal relevance. When finalizing invoices, JustOn creates unique and unalterable numbers based on defined counters. For a complete list of available invoice information and invoice line item information, see Invoice and InvoiceLineItem. You can edit basic data, addresses, distribution instructions, etc. of draft invoices. Open the invoice you want to modify. Double-click the fields to be modified and specify the information as required. Usually, the text fields as listed in Template Structure and Building Blocks are empty for draft invoices. The corresponding values are taken from the template when generating the PDF preview or when finalizing the invoice. Depending on your organization's requirements, you must modify the texts for individual invoices, that is, without applying the changes to the invoice template. To this end, you can copy the text field contents of the template to the draft invoice and then modify the texts as required. Make sure that the button Copy Text is available on the invoice detail view, see Enabling Template Text Copies. This copies the contents of the template text fields to the current draft invoice. In the Texts section, double-click the fields to be modified and specify the information as required. Invoice line items represent the product information of billable items in an invoice. This information will be part of the invoice PDF copy, and the included pricing details are the base for calculating the invoice total. Open the Invoice Line Items list. Specify the information as required. The mandatory information include the product title, unit price, quantity and tax rate. Click the number of the invoice line item to be cloned to open its detail view. This displays the product title, unit price, quantity and tax rate of the invoice line item to be cloned. This creates a duplicate of the current invoice line item, including all available information, and adds it to the current invoice. Click New Line Item from Product. Specify at least the quantity and the tax rate. This saves the new invoice line item and returns you to the invoice detail page. 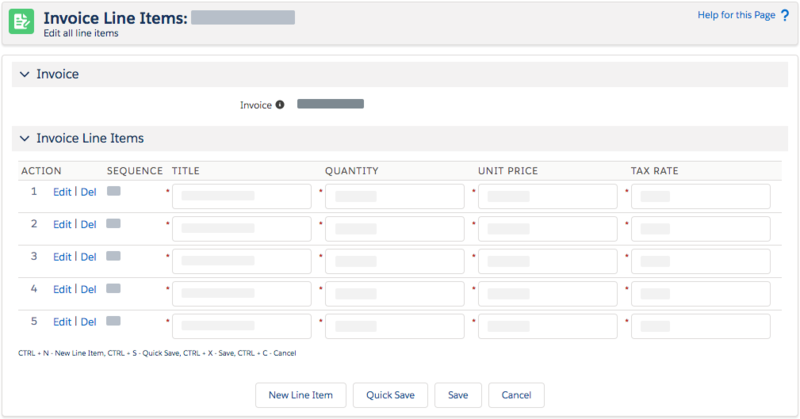 Click Edit in the row of the invoice line item you want to modify. Modify the data as required. The data available for editing depends on your configuration. For details, see Configuring Mass Edit Fields. This saves the modified invoice line items and returns you to the invoice detail page. Edit Opens the current invoice line item in the Edit Invoice Line Item dialog in a new browser tab/window. Del Removes the current invoice line item. This immediately deletes the invoice line item after confirming the notice dialog. Clicking Cancel does not undo this action. New Line Item Adds a new invoice line item, prompting you to provide the mandatory information. Quick Save Saves your current modifications and leaves you on the Edit All page. Save Saves your modifications and returns you to the invoice detail page. Click Delete in the row of the invoice line item you want to remove. This displays the product title, unit price, quantity and tax rate of the invoice line item to be deleted. This removes the invoice line item from the current invoice and updates the invoice information accordingly. Usually, JustOn determines the Payment Due Date of an invoice adding the value of Payment Due (in days) to the set Invoice Date. Your business may, however, require a more flexible way - like, for example, you want the Payment Due Date always to be set automatically to the last day of the next month. To this end, use the Invoice field Payment Due Condition. It provides a way to define a custom calculation for the Payment Due Date and for the Payment Due value. JustOn evaluates the Payment Due Condition when the invoice is created and an invoice date is set as well as when an invoice is finalized. Each evaluation recalculates the values for Payment Due Date and Payment Due. Hence, do not set Payment Due when using Payment Due Condition. Double-click the Payment Due Condition field and specify the intended calculation condition. As an alternative to the manual configuration, you can have JustOn set the payment due condition automatically. When creating invoices from subscriptions, you can set the Payment Due Condition field on the subscription. When creating invoices from other objects using the generic invoice run, you create the ON field ON_PaymentDueCondition on the source object to have these values set on the resulting invoice. To define payment due conditions on an account-specific basis, you create and set the ON field ON_PaymentDueCondition on the account. Make sure that the order discount feature is set up accordingly. Specify the (percentage) discount value as required. Subtotal (net) The sum of all total net values of the invoice line items without order discount. Order Discount (X.X%) Shows the discount percentage and the discount amount. Subtotal (discounted) Subtotal (net) minus order discount amount. If there is no order discount defined, the invoice will display only the subtotal (net). Double-click the Discount Rate field and specify the percentage by which the grand total is to be reduced. Optionally, double-click the Discount Payment Due field and modify the time during which the discounted total is due. The default period is 14 days. For details, see Enabling Installments. If installments are set up accordingly, you can define an installment type for an invoice. This triggers the automatic payment plan generation when finalizing the invoice or when re-generating it in the continuous invoice run. Alternatively, you can click the invoice ID to open the invoice, click Edit in the detail view, and then select the payment plan from the Installment Type picklist. This activates the selected installment type. If installments are set up accordingly, you can manually create a payment plan for draft or open invoices. Make sure that the Installments button is available in the invoice layout. For help about modifying page layouts, see Managing Pages. Select the intended installment type. This creates the payment plan, applying the selected installment type. You can overwrite existing payment plans selecting and applying another installment type. You can delete an existing payment plan. In the Installment Type picklist, select None. This deletes the installments from the invoice. Open the invoice you want to clone. The mandatory information include the account to which the new invoice will be related and the invoice template used to render the PDF copy. Optionally, select/deselect the invoice line items. This creates a cloned draft copy of the current invoice, opening it in the detail view, ready for being edited as required. Note that cloning an invoice does not consider the tax delta.